Here’s a recipe for gluten-free Chocolate Peanut Butter Biscotti. 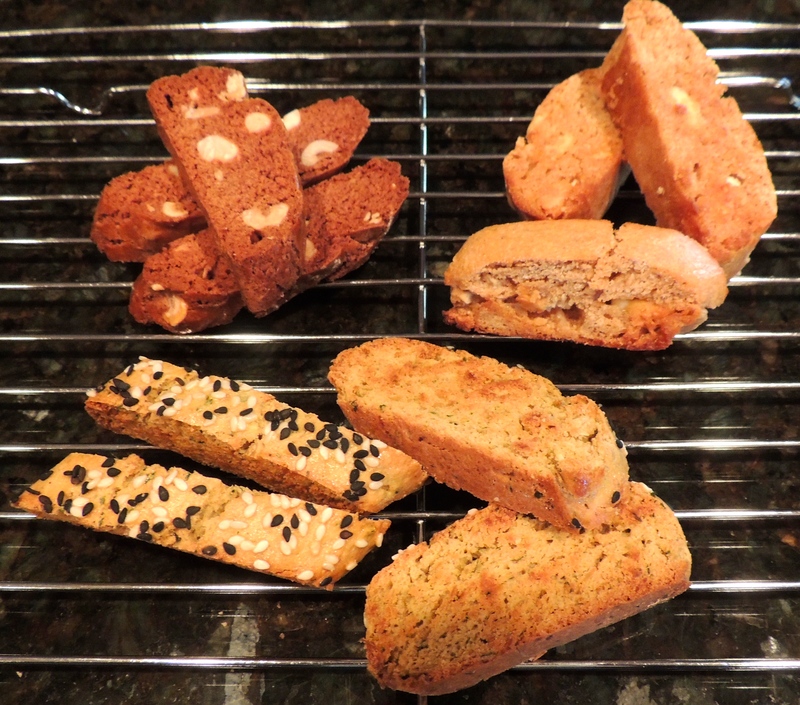 I also want to share my research and solutions to making a great tasting gluten-free biscotti with excellent texture. Eating gluten-free eating is having its 15 minutes of fame. With awareness of celiac disease (an autoimmune disorder where ingesting gluten can damage the small intestine) and other gluten allergies and intolerances on the rise, there are more options than ever for those who want to eat gluten-free. There are also many excellent cooking blogs entirely devoted to gluten-free cooking, such as Gluten-Free Girl and the Chef, Elana’s Pantry, and Celiac Chicks. I became interested in gluten-free baking when I realized I had a family, friends, and colleagues who either suffer from celiac disease or have a low tolerance for gluten. This means they aren’t able to enjoy my biscotti, which lead to a lot of research on how to exchange all-purpose flour for a gluten-free version. Baking gluten-free presents a challenge. Without gluten as a binding agent, the chances of the cookies breaking and crumbling increases. Despite some early failed attempts, I persisted, thanks to ample encouragement from my friends, who are always on the hunt for high-quality, good-tasting gluten-free treats. I had a handle on the flavor profiles, but the real challenge with gluten-free biscotti is the texture. There are a number of gluten-free flours available and I needed to find out how they work and which is best. King Arthur makes an excellent gluten-free multipurpose flour, which uses both white and brown rice as well as tapioca and potato starches. It has a nice texture and a neutral taste. Bob’s Red Mill also sells a gluten-free all-purpose flour, which is made from garbanzo bean flour, potato starch, tapioca flour, sorghum flour, and fava bean flour. The beans and sorghum have a noticeable flavor, but I’ve found that the two brands work equally well. To compensate for the loss of gluten, guar gum and/or xanthan gum are used to stabilize the dough. In my experience, without these gums, the log of biscotti easily crumbles. Use an equal mixture of the two for best results. Too much guar gum can produce a stringy dough and too much xanthan gum may create an unappealing gumminess. One-quarter teaspoon each, per cup of flour is sufficient. After some initial trial and error, I’ve honed my techniques for delicious gluten-free biscotti with great texture. Less fillings, such as chocolate and nuts, make a difference. The presence of these chunks prevent the dough from staying connected. Of course, there is no guarantee, even with regular biscotti, that a biscotto or two won’t break, but the likelihood of this happening increases with gluten-free versions. The real key—a shout-out to Shauna Ahern of Gluten-Free Girl for passing this along—is to let the baked biscotti sit until it has cooled completely before cutting. Shauna recommends letting it sit overnight, but if you’re less patient (as I am), two hours is sufficient. Giving your gluten-free biscotti the extra time to cool helps ensure that they’ll hold together as well as those made with wheat flour. Following is my recipe for the Gluten-Free Chocolate Peanut Butter Biscotti. A delicious, gluten-free biscotti with peanut butter and chocolate that won’t disappoint in taste or texture! Beat one egg until frothy and set aside with a pastry brush. Line a 17- by 10- by 1-inch baking sheet with parchment paper. Beat the eggs, sugars, vanilla extract and salt in an electric mixer, fitted with the beater attachment, on high until thickened, about two minutes. Mix in the peanuts, chocolate and peanut butter. Add the flour, baking powder xanthin gum and guar gum. and beat on low, scraping the sides as needed, until the flour is moist. Scrape sides and beater once more and mix on medium high until the dough is smooth, about ten seconds. Place the dough onto a lightly floured surface and form a thick log. Roll the log back and forth, adding bit of dusting flour as needed, until the log is 18-inches long by 2-inches wide. Cut it in half, place on the prepared sheet tray and gently press the log to about a 1/2-inch thickness. Brush each log with the egg wash, place in the preheated oven and bake for 30 minutes. Remove to a cooling rack and let sit for at least two hours or overnight. Cut the log on an angle into 1/2-inch slices and lay flat on the sheet tray and bake for 15 minutes. Cool and store in an airtight container. The recipe calls for 3 1/2 to 4 ounces chocolate because not all chocolate manufacturers sell the same size bars. Don’t fret, use whichever brand you like. My preference is primarily Lindt (3 1/2 ounces).